We had a great hike up to the old Goode Lookout site. Bridge Creek, where we stayed the night before, was beautiful all by itself. The water is incredibly clear – no glaciers were harmed to make this stream! 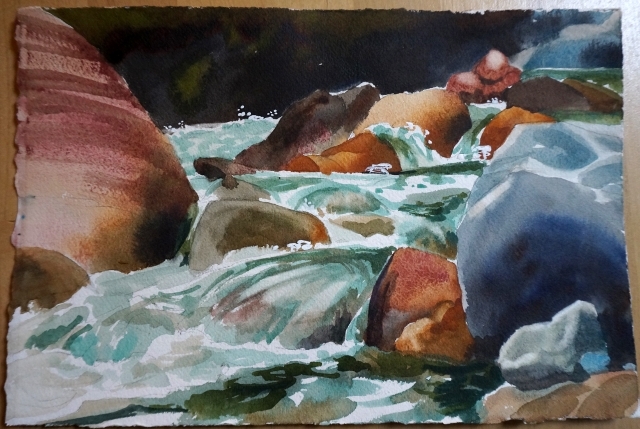 I always love the challenge of moving water. By the time we got to the top, weather had begun to move in. 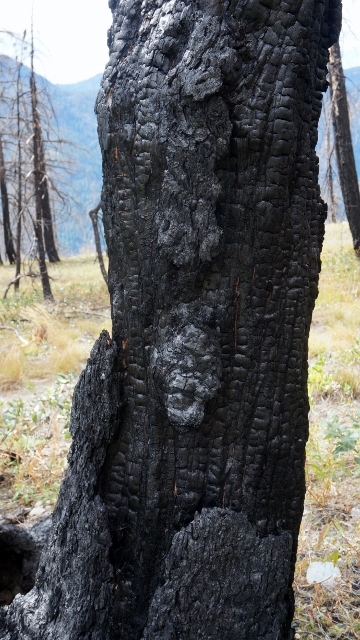 Tuesday, 9/24, I finished a large burned tree painting I had brought with me unfinished. I have to work on pieces larger than 15” x 22” indoors, so I do them when the weather isn’t so good. Still it needs a few days’ rest and re-examination. The longer I work a series, the more I obsessive and tight I seem to get. Time to get back to looser plein air work! What I do on location always informs my studio work, and vice versa. 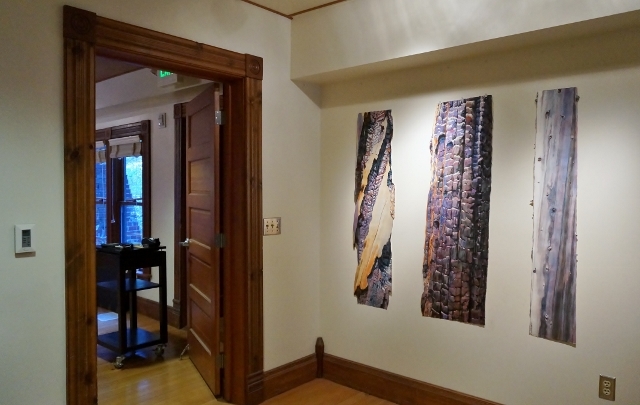 We hung 6 of the previous large trees in the Golden West Visitor Center. I’m proud to have them there, though nervous about the recently completed one that is not yet varnished. 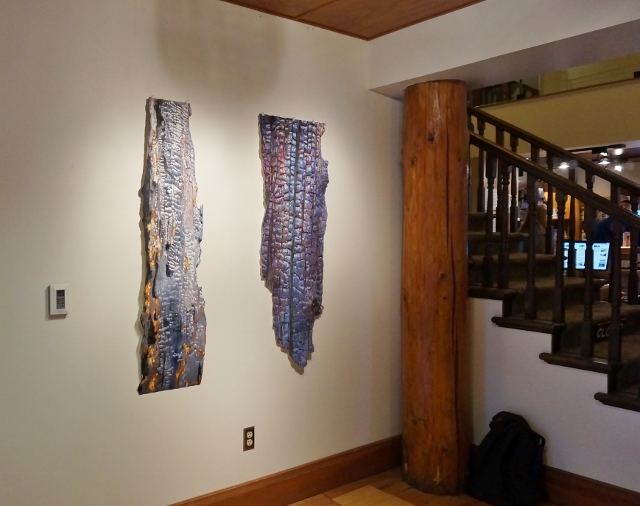 “Zion Spiral Burn,” “What Remains,” and “Stripped of its Bark” in the Golden West Visitor Center, Stehekin WA. Wish me luck. The forecast is good, but it may not be very warm! This morning my windows are fogged up from cold air for the first time. Yesterday local artist Roxanne Everett guided me most of the way up McGregor Mountain – over one hundred switchbacks to a Park Service radio repeater on the summit. We made it as far as a campsite 1000’ below the summit, which is still 5600’ of elevation gain. My knees are threatening mutiny. It was glorious to be in alpine terrain once again. The blueberries were ripe, the larches haven’t begun to turn, but there was a real chill in the ambient air, made more dramatic by a brisk wind. Later it was quite warm but only down in the valley. I better understand the geography from seeing it from so high above. 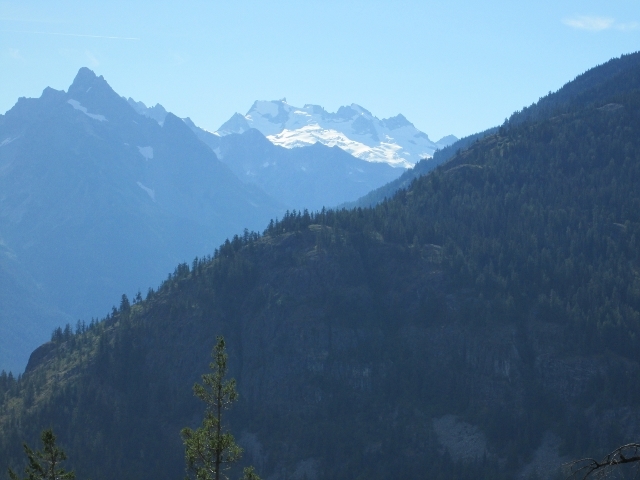 I was sentimental to see glacier-bound peaks I climbed 30 years ago. A quick sketch of Dome Peak from McGregor Mountain. 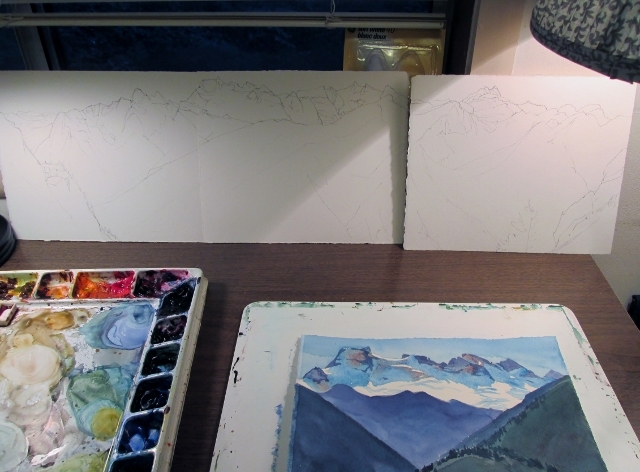 Behind the painting is the outline drawing done on location across three small sheets of watercolor paper. It will become a more expansive panorama of the same view. When I am with other people who may not be inclined to wait 2 hours in the cold for me to paint a complete picture, I still bring my paper and board. I make a rough outline of what I intend to paint and take a photo. Most people are willing to wait the 5-10 minutes that takes . It’s important to capture the proportions as I see them — or perhaps as I exaggerate them — which no camera will do. Color is somewhat arbitrary and personal anyway, and the camera does an OK job of capturing basic light and dark values. (It does tend to miss shadow and highlight subtleties.) I still like to paint the sheet as soon as possible after returning. 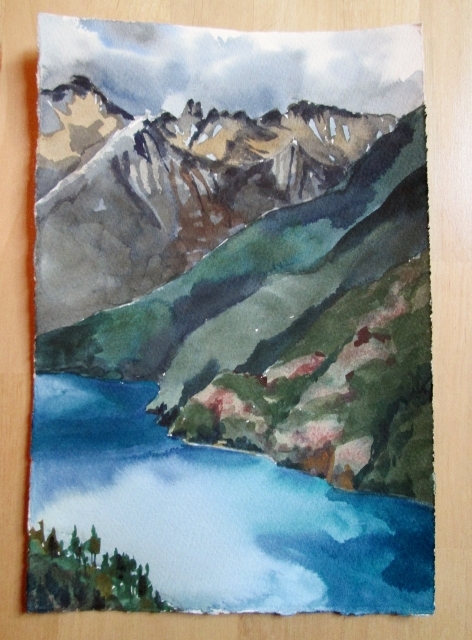 So far into this residency I seem only able to tackle scenic landscapes. I have already accumulated some wonderful source material of fire-sculpted trees, especially from the 2010 Rainbow Bridge fire. These will be great fodder for large studio paintings in the future. Near Rainbow Bridge, 2010 burn. I have been reading Flames in Our Forest by Stephen Arno, which makes the case for fire as a necessary factor in a healthy and diverse forest. But I haven’t yet done enough time alone, putting one foot after the other, to stretch for a deeper connection between the artistic process and the meaning of the work. It’s like I have to get through all that beauty first. Postscript September 22: I realize I should have posted the photo I took as well. You can see how different the proportions are between my interest — the distant massif — and what the point-and-shoot snapshot shows. Yesterday I left home at 3am. 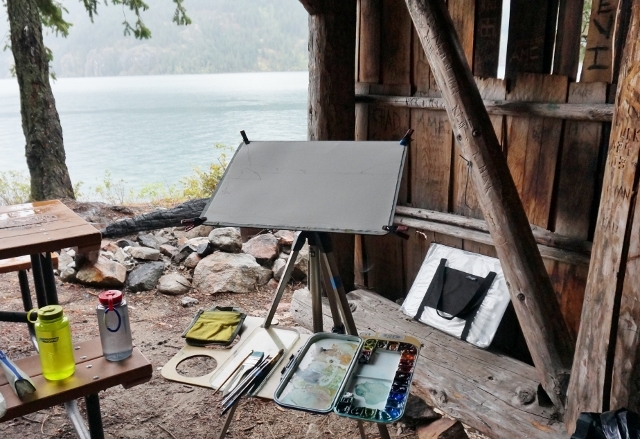 I wanted to have plenty of time to make the boat to tiny Stehekin to take up the temporary position of Artist-in-Residence at the North Cascades National Park. 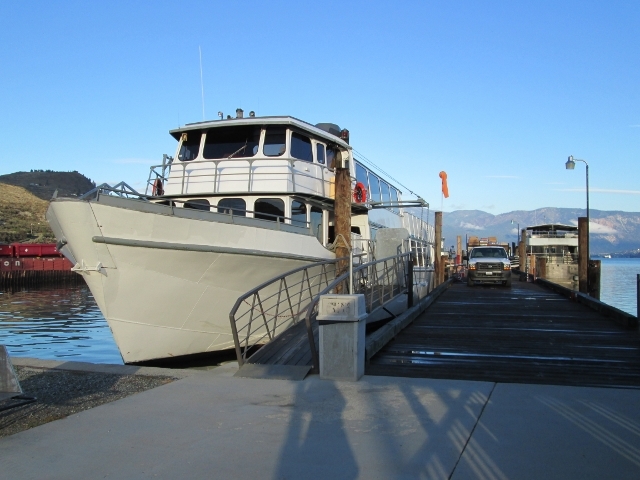 The boat leaves at 8:30 am from 50 miles down Lake Chelan. There are no roads into the ~80-person town. You can hike 20 or so miles, fly in a small plane, or take the boat, as most people do. 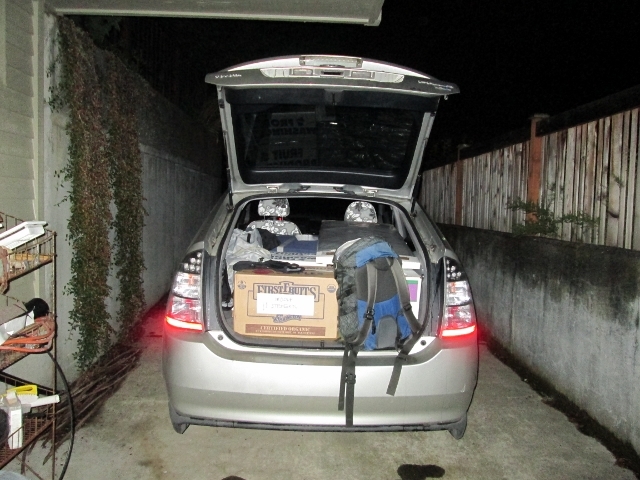 I had 260 lbs of baggage: two boxes of clothes, two boxes of art supplies, two large portfolios, a large and small backpack and four boxes of food. Guess what’s really important to me! Crammed full, ready to go. Lady of the Lake II makes a four-hour trip up to Stehekin. My housing is seasonal employee housing and a good ways from “town,” that is, where the boat landing/visitor center/convenience store are. Today I hiked part way towards Purple Pass. I saw no one, and the trail was soft and beautifully graded. The miles and feet of elevation flew by in cool weather. But it was not easy to ride the 4.5 miles back to employee housing on a heavy-duty mountain bike! I couldn’t resist the tipped-up perspective of the enormous local relief looking down the lake towards Lucerne and Holden. I remain enthralled by burned-over areas. This one burned in 2006. While most of the standing dead timber has thick charred bark, there were some fantastical forms and still-iridescent fire-scarring. I took many photos for future studio projects.